Record your audio,sound and voice to wav/mp3 files. 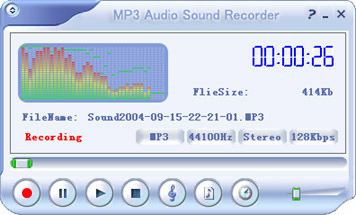 MP3 Audio Sound Recorder allows you to make high-quality audio recordings from any internal or external source into WAV/MP3 format sound file directly without costing any other disk space.You can get high quality sound,and easily download to an MP3 player. Start and stop recording at any time you set. Auto name by number mode and Date-Time mode or manual enter file name before recording. Integrates the complete set of record volume control for your convenience. Record on the fly for as long as your like without interrupt. What sources of the sound you may use with our MP3 Audio Sound Recorder? Record Music to WAV/MP3 files from your cassette tape directly. Record Singles to WAV/MP3 files from LP(long playing record) directly while playing. Record Voice to WAV/MP3 files from MIC directly. Record Sound to WAV/MP3 files from Internet Radio. Record Tracks to WAV/MP3 files from CD audio directly while playing. Record Sound to files from any other sound line in such as radio , TV , CD Player directly. Record Sound to files from any Multimedia software and games directly. Easy Hi-Q Recorder - Recording software to record music, record streaming Internet radio, record webcasts, convert LP's, convert records, convert tapes and a lot more.